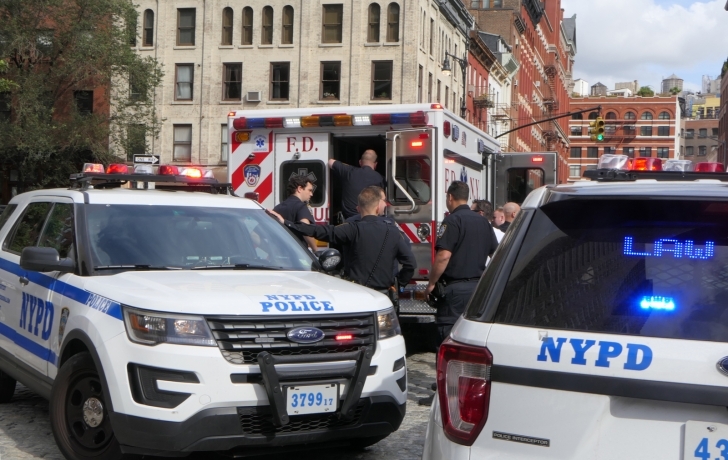 Police arrested a suspect Monday afternoon who they say threatend a man with a knife before stabbing the tires of parked cars on Harrison Street in Tribeca. Police say Abdulie Bah, 23, of the Bronx, had approached a man and threatened to cut him before a fight ensued. The man and his friends then chased Bah along Harrison Street, where the suspect stabbed the tires of parked cars along the way. Witnesses said they saw about five men in their early 20s chase the suspect down Greenwich Street to around Duane Street, then back to Harrison where police apprehended him. The suspect was placed in an ambulance where he could be heard yelling at officers before being driven away. “I saw him doing crazy things with a knife,” said a worker who was part of a construction crew at the corner of Harrison and Greenwich. After turning the corner on Greenwich Street, another witness said, the suspect no longer had the knife. As of about an hour after the arrest at 3:09, a search by police had not turned up the knife. According to a police source, the knife threat took place on Pier 25 before the suspect was chased across West Street and into Tribeca. A couple of hours earlier, a half-dozen cops had gathered at Pier 25 for an apparent investigation. It is unclear if the two episodes are related. Bah was charged with three counts of criminal mischief, criminal posession of a weapon and one count of menacing.